Thank you for participating in the 2017-18 Unsolicited Exhibition Program. We received 515 eligible proposals from 66 countries, which were voted on over the course of a month by an international panel of over 200 jurors. Jurors were asked to read at least 50 anonymous proposals and cast nearly 9,000 votes to determine the highest scoring proposals. * Proposals are ideas for exhibitions. While the idea will remain as stated, all information and details, including artist participation are subject to change. A musician from Saturn; A Syrian Cosmonaut; A woman named Napuli Paul Langa, who crossed an ocean to seek asylum and now refuses to take another step. These are some of the real-life characters in Fellow Travelers, an exhibition that initiates an encounter between people displaced by the deterioration of neo-liberal policies around the world. At their most optimistic, these policies generated a vision of scientific progress symbolized by the race for space. While both NASA and the Soviet space program considered space a terrain ripe for ideological expansion, artists such as musician-prophet Sun Ra reimaged these paradigms to create utopic solutions for oppressed communities. Sun Ra developed his free-wheeling philosophy (later associated with Afrofuturism) while traveling from Louisiana to Chicago during the Great Migration in 1947. Adopting the persona of an alien sent from Saturn to resettle black earthlings on a better planet, Sun Ra crafted a mythology that was as deeply engaged with black liberation as it was galactic travel. Now, in another moment of mass migration, artists have once again turned to outer space in order to mitigate earthly catastrophes. 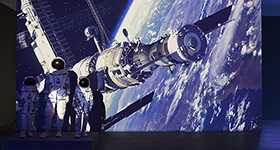 Turkish artist Halil Altindere’s Space Refugee (2016) revolves around Muhammed Ahmed Faris, who began as a cosmonaut in the Syrian-Russian space program, became an opponent of Assad’s regime, and is now a refugee in Turkey. Weaving new layers of science fiction around an already legendary character, Altindere uses socialist realism, bespoke spacesuits, augmented reality, and expert testimonials to cast Faris as the hero of a new space program whose mission is to resettle unwanted refugees on Mars. As in Sun Ra’s equations, the act of imagining space as an outsider’s utopia betrays bitter cynicism about ever finding a sense of belonging on earth. Conversely, Berlin based artist Azin Fezabadi explores just such a possibility. Re-envisioning an ancient Saudi Arabian poem of love and exile as a space odyssey, his film Uchronia (2016) tells the story of two aliens looking for human bodies in order to finally consummate their love. While these projects posit travel as a gesture of resistance, others explore the refusal to leave as a form of protest. Artist duo Lou Cantor explores instances of spontaneous collective action. Inspired by travelers on a Swedish airline who recently thwarted the deportation of a fellow passenger by refusing to fasten their seatbelts, Lou Cantor asks: which small gestures can destabilize the system? Sudanese refugee-turned-activist Napuli Paul Langa attempted to find out. Her occupation of a tree in central Berlin is the subject of Berlin-based artist Tobias Zielony’s ongoing project, The Citizen (2015). Since February 2014 Zielony has followed refugee activists in Hamburg and Berlin, often giving them his camera so that they can represent themselves and their peers on their own terms. In a society obsessed with the visual, there is an increasing tendency to mistake good images with good architecture. Even real buildings tend to imitate the aesthetics of digital architecture, leading to a hyper-real experience of physical spaces. In the current regeneration frenzy, the real estate market has a strong stake in this trend as global cities become overpopulated with luxury housing and exclusive working spaces advertised through glossy billboards, in striking contrast to the raw construction sites they overlook. The exhibition will be built up throughout its duration: we intend to begin with an almost empty space and then build up to include physical works by five artists who explore the visual language and ideology behind the marketing of luxury property and development plans. 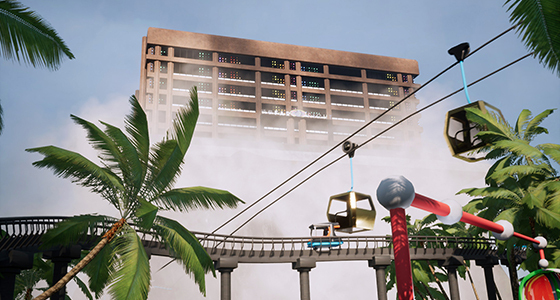 Through her large scale installations, Felicity Hammond constructs hyper-real environments, borrowing the indeterminate nature of virtually rendered luxury, while Laura Yuile's sculptures and performative practice mocks the marketing of generic stock photos and computer-generated images advertising luxury properties, while drawing upon issues of privatisation of public space and demolition of buildings to make space for sanitised architectures. Max Colson's practice reflects on advertising imagery used to market privatized urban public spaces to the public, to emphasize how such scenes often promote these areas as utopian and inclusive social environments, despite their being highly surveilled and regulated. Lawrence Lek creates digital environments often based on real places, reflecting the impact of the virtual on our perception of reality. Katy Connor's app lets it users trace the invisible flows of digital signals that bounce off of architectural structures, while her video work and prints show the imperceptible digital mesh that surrounds us. 'Rendered Cities' will be accompanied by a public programme of screenings, artists talks and performances all involving the participating artists and leaving physical traces in the evolving space of the exhibition. Growing up in the context of the Lebanese civil war, my childhood memories are fragments of extraordinary and ordinary scenes, collaged together: Faded signs,pockmarked buildings, endless traffic jams at innumerable checkpoints, Arabic coffee and Marlboro cigarettes, the darkness of nights with no electricity, flickering grainy TVs blasting the evening News, battery powered pocket radios, black-out candles and long cast shadows, the smell of kerosene lamps, flashlights, and the sounds of metallic thunder. Light in wartime is a precarious thing. Bill Brandt conjured the wartime city on blackout nights, as he rambled down the darkened familiar avenues made suddenly strange - a darkened town lit only by moonlight, and darkness as the ordinary condition of the world. The Syrian poet Adonis, wrote of this mystical light of darkness and darkness of light in his poem ‘candlelight’, that he encountered living in a city under siege, which allowed him to create an intimate relationship with darkness. This exhibition explores wartime ‘light’, metaphorically and technically, in the context of photography. As darkness falls, and bombs light up the night sky, the domestic space provides protection against the outside world, yet becomes a target of the conflict and part of its operational weaponry as displayed in the work of Nilu Izadi. Izadi utilizes the bullet holes on Beirut’s historic landmark Yellow House as apertures for an actual camera obscura. With one bullet hole and a darkened room, she transformed the house into a camera obscura. Lamia Joreige reenacts the notorious sniper’s line of sight through pinhole camera views to envision the sniper's perspective of the city. Vartan Avakian prints the silver particles of film debris found in the dust of a war-torn building, into photographs. In war-time, one's mind and imagination becomes a place of refuge from the imploding universe. Photographers such as David Levinthal, Hashem Al Madani, Nidaa Badwan, Shirley Wegner, expose the sense of play inherent to lives entangled in the theater of war, where the studio, ‘spotlight’ moment, becomes a site for escape, creativity, and reflection. The aftermath of destruction in wartime is a strange mix of the extraordinary and ordinary. 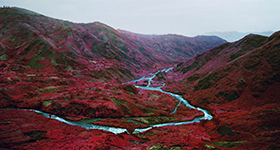 Richard Mosse, Jo Ractliffe and Patrick Willocq, reflect on the beauty and tragedy of War. Mosse's uses infrared film to capture a surreal vision of the war-torn Congolese landscapes, questioning the representation of war and the construction of photography. Willocq recreates war-children's drawings into 3d Tableaus. Jo Ractliffe tells tales of war and conflict through bland-scapes devoid of humans. Photography is used reflexively in order to question the ways in which war photography is constructed. For more information on apexart open calls, how to apply or get involved, or to read full texts of other past winning proposals, visit our Unsolicited Exhibition Program page. For the Unsolicited Exhibition Program, ideas for exhibitions are entered online and limited to 500 words. For the evaluation, a large number of jurors are invited to weigh in. apexart custom wrote a computer script that allows people to submit online and then substitutes a number for their name. On the jury side, the script constantly randomizes the order of the submissions so no one proposal is always first or second. Relying on the idea of “crowd sourcing,” the jurors are given unique usernames and passwords and asked to read at least 50 proposals, with the idea that fresh eyes and the overlap of readers will produce a more objective result.